The project “Smart m-Health Application for Pregnancy Care Using Body Area Networks” developed with MySignals Hardware platform won the Most Innovative Project award at the 2nd International Saudi Health Informatics Conference (ISHIC) 2017 in Riyadh, Saudi Arabia. Hypertensive disorders and gestational diabetes are the most common diseases during pregnancy. Hypertension causes about 10% of maternal deaths and gestational diabetes has an incidence rate of 9,2%. Remote patient monitoring can help in early detection of risk situations. Mobile devices have a great potential in providing healthcare to pregnant women and can assist in monitoring their health remotely. A group of students (May Nasser Al-Hajri -leader-, Manal Ali Al-Shamrani, Ghadeer Ibrahem Al-Koblan, Amal Mohammed Al-Qahtani, Wejdan Saleh Al-Zahrani and supervised by Dr. Nagwan Abdel Samee) of Princess Nora University in Saudi Arabia have proposed a system for pregnancy care using MySignals Hardware, the development platform for medical devices and eHealth applications created by Libelium. 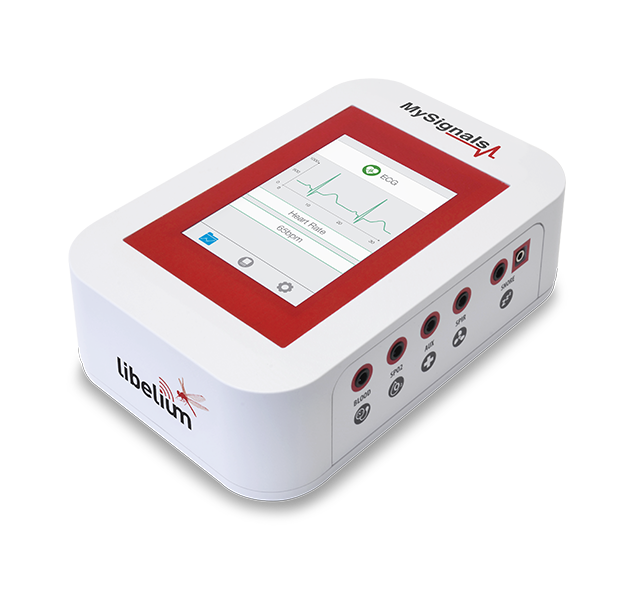 The complete system includes MySignals Hardware system and mobile application GluPre, which alerts patients to take measurements at specific times. Information is send via Bluetooth from sensors to MySignals platform and from MySignals platform to the GluPre mobile application. The software application uses decision based tree classification algorithms to better identify risks helping the physician in decision-making process during patient appointment and to prevent emergency situations. This entry was posted in General on November 28, 2017 by Cooking Hacks. The MySignals HW BLE v2 – eHealth and Medical IoT Development Platform for Arduino contains sensors that measure more than 20 biometric parameters. One of the most interesting is the Bluetooth LE SpO2 sensor How to get started reading live data and visualizing it on the TFT display of the board? The MySignals HW kit contains a shield that requires an Arduino Uno as base. In contrast to the (more expensive) MySignals SW kit, the HW kit is rather basic. Powering it up results in a white screen, instead of a nice interface on the screen. The rest is up to the software developer. As the development is based on Arduino, you need the latest version of the Arduino IDE. The MySignals libraries are not available through the Arduino Library Manager repository, but need to be installed manually. The download link to the latest version is a bit hidden in the tutorial at step 5 – currently, the SDK is at version 2.0.1. Extract the zip file. This gives you two folders: libraries and examples. The libraries folder contains 5 different libs – you need to install all of these through the Arduino IDE: Sketch > Include Library > Add .ZIP Library…. Afterwards, restart the Arduino IDE to also see the examples in File > Examples. To get started, I decided to test the Bluetooth LE SpO2 sensor first. The small measurement device requires two AAA batteries and clips to your fingertip. By pressing the single button on the device, the sensor activates for a certain time, advertises itself via Bluetooth LE and starts measuring pulse and SpO2 through a (red) light sensor. Unfortunately, the examples in the HW Kit SDK you just downloaded only include an example for the wired pulse oximeter, but not for the Bluetooth LE variant. The relevant example is available in the tutorial in section 6.2.2.4. You need the TFT example. Be careful not to use the TFT BLE Example from the tutorial section 7.1.2, which also uses the SpO2 sensor – that version of the example misses a few lines of Bluetooth init code (to activate the UART Flow control) and fails to run. Only version 2.0 of the example works; version 0.1 in section 7.1.2 of the tutorial doesn’t. Copy the code to your Arduino IDE. It doesn’t work out of the box, though – you still need to configure the code. Close to the top, the example code contains a line “Write here the MAC address of BLE device to find”. Now, compiling and uploading to the Arduino controller works. For some reason, the MySignals HW kit continuously outputs strange data over the serial port. However, as the tutorial example uses the TFT display for showing the measurements, we can ignore the serial output. After running the example, press the button on the pulse oximeter and wait several seconds until the board finds the BLE sensor, connects, subscribes and gets the real-time measurements. In case you want to directly use the sensor, e.g., from a custom mobile app: a bit more information about the BLE profiles is published in a short PDF. The GATT profile information isn’t provided by the manufacturer, according to a recent forum post. This post was written by Andreas Jakl and published in his blog www.andreasjakl.com. 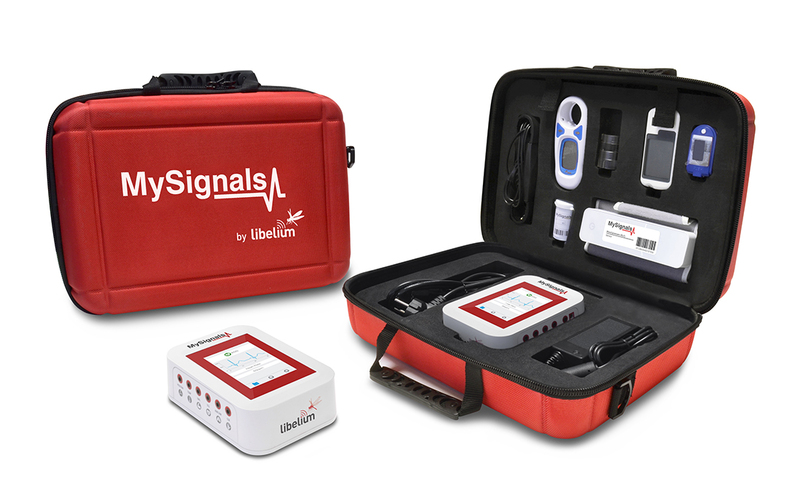 Libelium releases a new improved version of MySignals, the most complete eHealth development platform now equipped with 17 different sensors that measure the most important biometric parameters. The platform allows real time visualization of the data gathered and also to be stored on the MySignals' Cloud where the information is sent encrypted enabling to manage different user profiles. MySignals is the Libelium's IoT eHealth Platform meant to be a portable hospital, with the size of a book and 100 times cheaper than current market solutions. This innovation integrates in a small suitcase all the sensors and monitoring tools that can be found in an Emergency Observation Room of a Hospital. The new version of MySignals improves usability and navigation speed thanks to a more powerful and larger TFT touchscreen, creating a new user experience and allowing to have the system up and running in seconds. “MySignals is the perfect development tool for new medical IoT devices and eHealth cloud services that need to be tested with real biometric values”, David Gascón, Libelium's CTO states. With the new MySignals' version, users can choose from 17 different biometric sensors to measure the most important body parameters such as pulse, breath rate, oxygen in blood, temperature, electrocardiogram signals, blood pressure, muscle electromyographic signals, glucose levels, galvanic skin response, lung capacity, snore waves, patient position, airflow and body scale parameters. An alarm button has also been included to connect the user with emergency services. Twenty step-by-step video tutorials with settings and instructions enable a quick test of the platform in just a few minutes. “We wanted our clients to be using MySignals in minutes from scratch, so we decided to create 20 step-by step tutorials that would make the process quick and easy”, David Gascón says. MySignals improves the future of health services to cover one of the main challenges of the century: enhancing the universal accessibility to a healthcare system for more than 2 billion people worldwide that lives in rural areas with very limited access to hospitals. Moreover, a recent trial on tele health in Australia revealed that self health care monitoring technology could save $3 billion yearly to public health services in avoidable admissions to hospital, reduced length of stay and fewer demands on primary care. “MySignals includes everything needed to bring together a service as necessary for the population as remote medical assistance”, David Gascón affirms. Libelium delivers new Cloud Storage Plans for MySignals' customers facing up the strategic shift of the company to provide solutions for the whole IoT value chain, from hardware devices to cloud services. User Cloud Plans are meant to be used to test the performance of MySignals. In this case all the data is sent to the Libelium Cloud, so users do not need to set up their own servers. Developer Cloud Plans are the best option for users who want to store the data gathered by MySignals in their own servers. This type of plans allows to use the Cloud API to read the information from the Libelium Cloud and write it in their own Cloud platforms. A bigger TFT screen with a 30% longer screen diagonal (3.5” vs 2.4”), which means an increase of 100% of the real touch surface area, making the gathered data easier to read. Two new Bluetooth sensors (BLE): one to measure body temperature and an alert button to connect with emergency services when urgent assistance is needed. Two security layers implemented to send the information: payload encryption with AES 256 + HTTPS for server communications. Twenty new video tutorials with step-by-step settings and instructions to allow a quick test of the platform in just a few minutes. The video tutorials show how to use all the sensors in stand alone mode along with the usage of the Bluetooth and WiFi modes to send the information from MySignals to the Cloud. MySignals platform includes CE, FCC and IC certifications. Visit the official website of MySignals to know all the details of the platform. Try now a Demo of MySignals' Cloud! This entry was posted in General on September 26, 2017 by Cooking Hacks. During summer holidays hundreds of suitcases get lost and this is a common worry among tourists. This kind of issues can ruin your trip so, besides of using an identification label, you can develop a GPS project to get your luggage located in every moment. 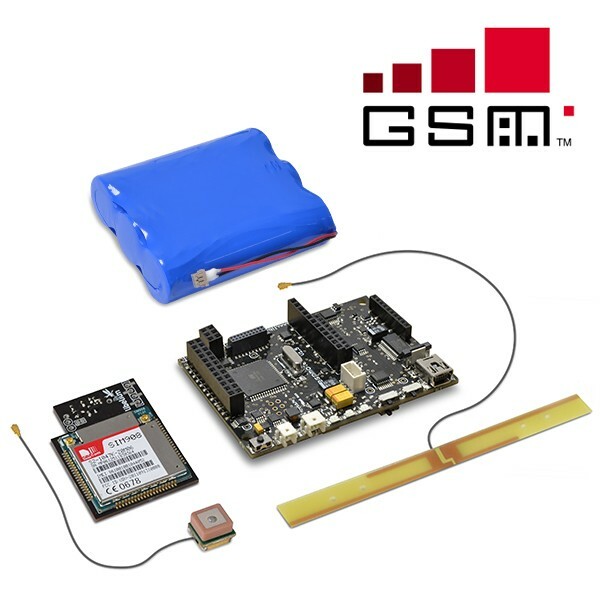 We suggest you to use our tracking solutions based on the most well-known development boards Waspmote Sensor Platform, Arduino and Raspberry Pi: GPRS+GPS IoT Starter Kit, 4G IoT Starter Kit (4G / 3G / GPRS / GSM / GPS / LTE / WCDMA / HSPA+) and Tracking Kit (GPRS+GPS). 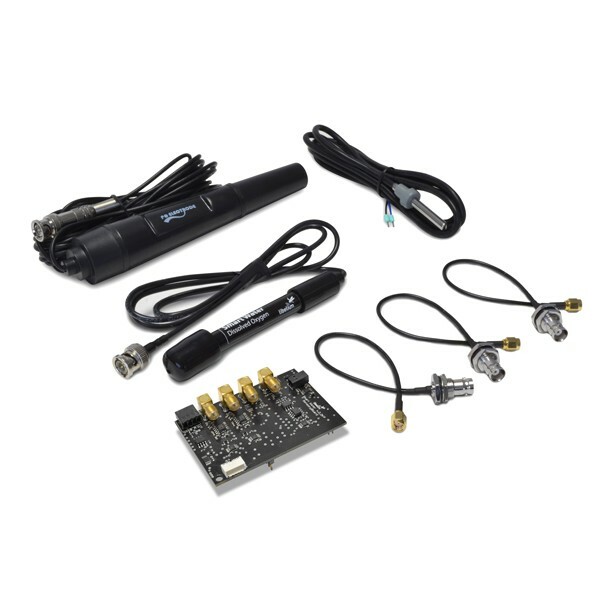 These kits enable to develop real time tracking applications which read GPS coordinates (longitude and latitude) with different GPS antennas and send them by means of cellular communication protocols using a HTTP request to a web server. Besides, you can visualize this data in a maps app as Google Maps, in order to control the location of your luggage. 4G + GPS Shield for Arduino and Raspberry Pi Tutorial (LTE / WCDMA / HSPA+ / 3G / GPRS). Geolocation Tracker (GPRS + GPS) with SIM908 over Arduino and Raspberry Pi. Where is my car? Realtime GPS+GPRS Tracking of Vehicles Using Arduino. Now you can go on holidays without worrying about your luggage because you will know where it is in every moment. This entry was posted in General on June 27, 2017 by Cooking Hacks. Water and electrical supply are two of the main concerns for public authorities and to improve its management helped by IoT can suppose important economic savings. 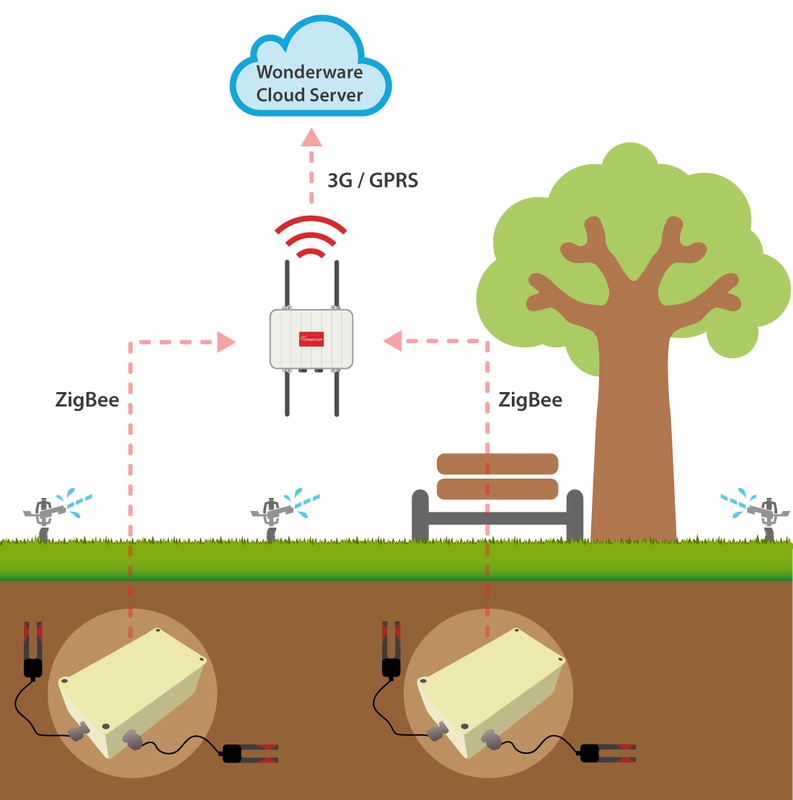 Waspmote Sensor Platform can be used to develop Smart Water infrastructures as drainage or water supply plans, leakage detection services, network performance optimization and GIS management. Libelium has participated in iWesla, an European project which stands for improving water efficiency and safety, developing and deploying a demand-side cyber-physical system (CPS) to optimize the water consumption efficiency and safety in living areas. In this project, engineers installed Waspmote Sensor Platform to develop the wireless sensor networks. It is inside an encapsulation model in order to protect the board. As a gateway, they used a Meshlium Gateway provided by Libelium. Besides, the deployment also included high-accuracy water flow meters installed in the main water supply pipe of the living area to provide real-time water flow data and solenoid-based electric valves to control (open-close) the water supply into the living area. Waspmote Sensor Platform gathers data and send them through different communication protocols (GPRS, 3G, 4G, LoRaWAN, LoRa, Sigfox, 868 MHz, 900 MHz, ZigBee, 802.15.4, WiFi, RFID, NFC and Bluetooth 4.0) to the gateway. In this case, it uses 3G. 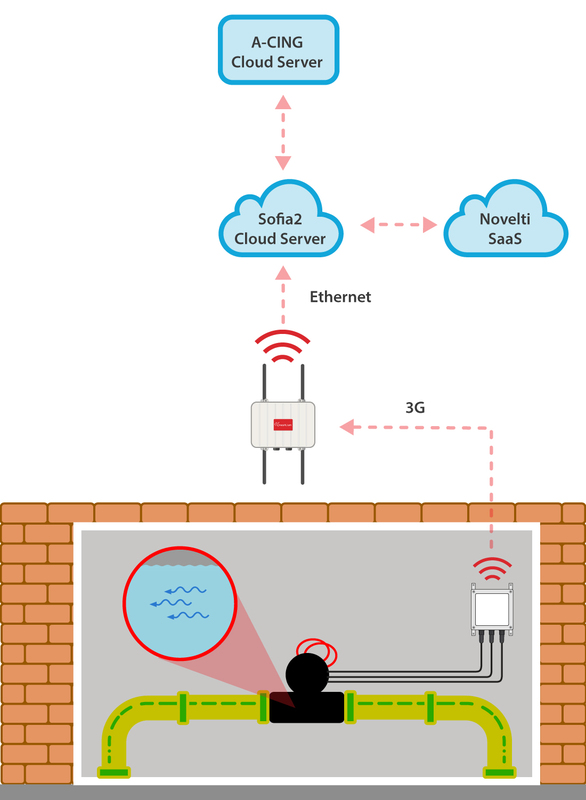 Meshlium gateway sends the data to the cloud by means of an Ethernet connection in order to visualize the disaggregated water usage made by all consumption points in a Sofia2 based Application. The detection of abnormal water consumption is a key factor for facilities management. When this system detects deviations in normal data warns the users and enables them to actuate over the valves. This water efficiency and safety solution helps an early detection of potential damages caused by leaks or open taps and can mean savings up to 50% of the water consumption. In Cooking Hacks you can find two kits which can help you to develop a Smart Water solution to monitor water quality and efficient usage based on Waspmote Sensor Platform. With the Waspmote Smart Water Kit you can monitor remotely key parameters related to water quality as dissolved oxygen, oxidation-reduction potential, pH, conductivity, temperature and an extremely accurate turbidity sensor. 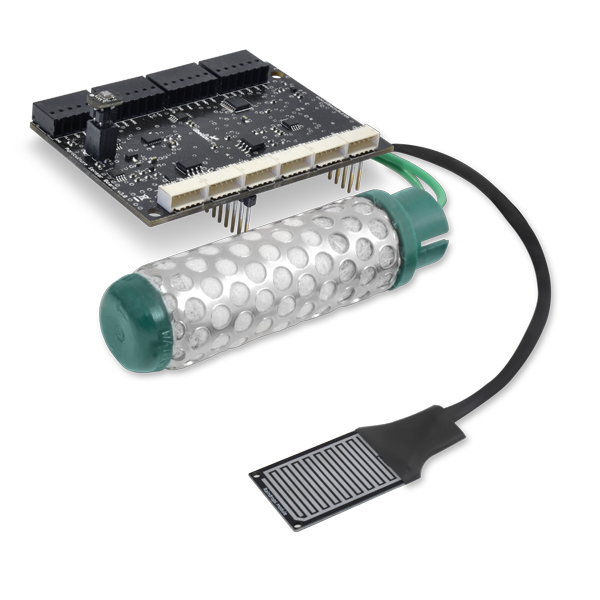 The Waspmote Events Sensor Kit allows to trigger different actuators when data gathered by the sensors connected overtake a threshold previously defined. These sensor are the Temperature, Humidity and Pressure Sensor, the PIR Sensor and the Water Leakage / Liquid Detection Sensor (Point). Develop the most complete and professional Smart Water Solution using our Waspmote Smart Water Kit and Waspmote Events Sensor Kit and start controlling the water consumption of entire buildings. This entry was posted in General on June 13, 2017 by Cooking Hacks. Imagine all electronic devices could be connected to the Internet. Imagine that those devices could communicate, send you information and do your bidding. With Cooking Hacks this is not a dream. 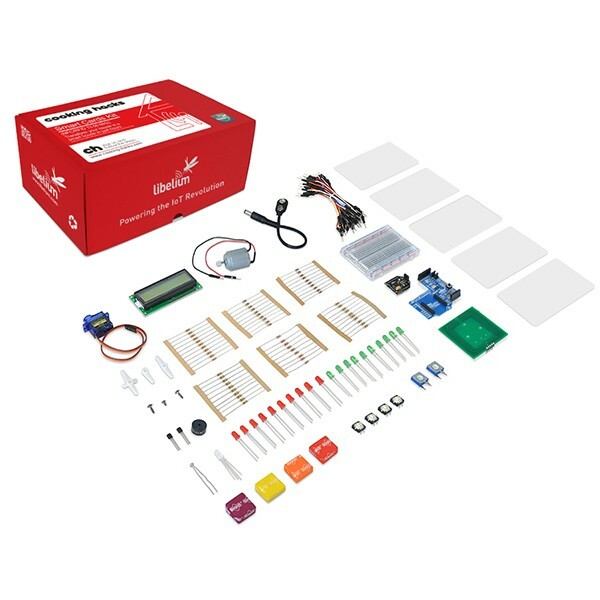 Make your IoT home automation project come true with our Arduino and Raspberry Pi Home Automation Starter Kits. All these kits are based on Arduino UNO and Raspberry Pi 3 development boards. 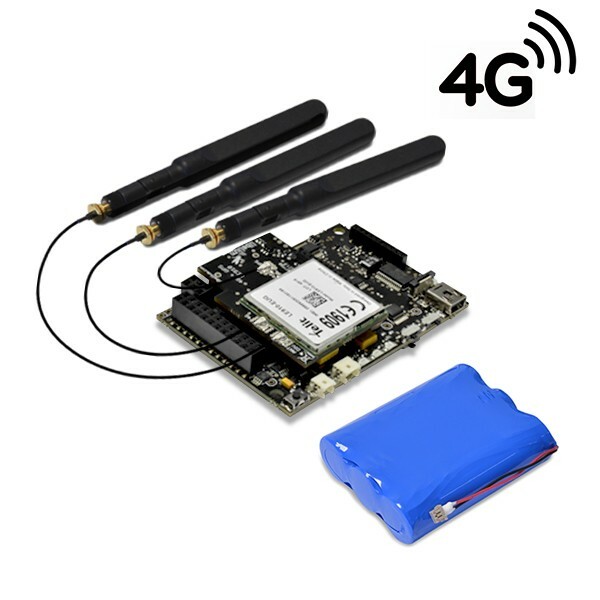 Moreover, they include different shields and modules which enable to work with the most well-known communication protocols as GPRS, 3G, 4G, LoRa, LoRaWAN, Sigfox, WiFi, Bluetooth, etc., which gives an idea of its high level of versatility. Besides, you are in luck because we have dropped the price of Arduino UNO and Raspberry Pi 3 development boards, which implies a price drop on all kits based on those platforms. You can control all devices of your home: from windows or lights to temperature or locks. 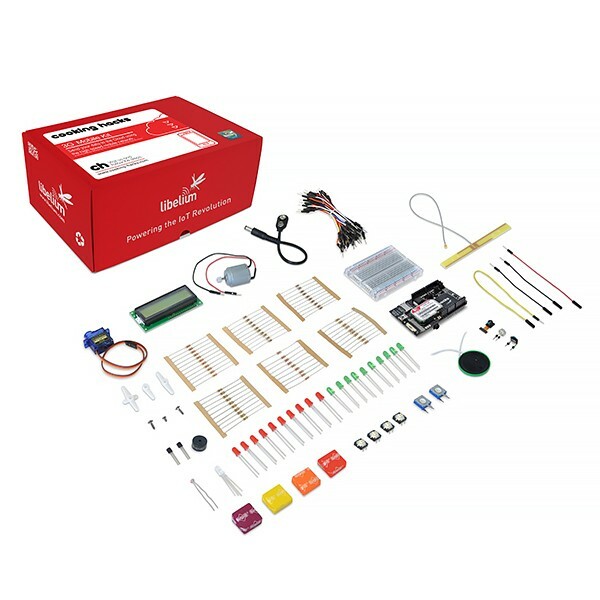 Visit the Home Automation category in order to find the wide range of Arduino and Raspberry Pi Starter Kits which help you to automatize your home and open the door to IoT. This entry was posted in General on May 29, 2017 by Cooking Hacks. Libelium sustains its education commitment launching the second edition of the IoT Spartans Challenge. The development of the IoT market is linked to the workforce that will be needed to program the 50 billion of IoT devices that are predicted to be connected to the Internet by 2020. This educational program focuses on covering the gap between the skills demanded by IoT companies and the practical knowledge of the engeneering students. The first three international Universities that have joined the Challenge are Aahrus University (from Denmark), IPCA (from Portugal) and UTP (from Panama), the winner of the past Spartans edition. Worldwide promotion through Social Media and Libelium PR tools. 2-day-Workshop for one teacher in Libelium headquarters in Zaragoza, Spain. Special discounts on Libelium hardware specially designed to teach and research. 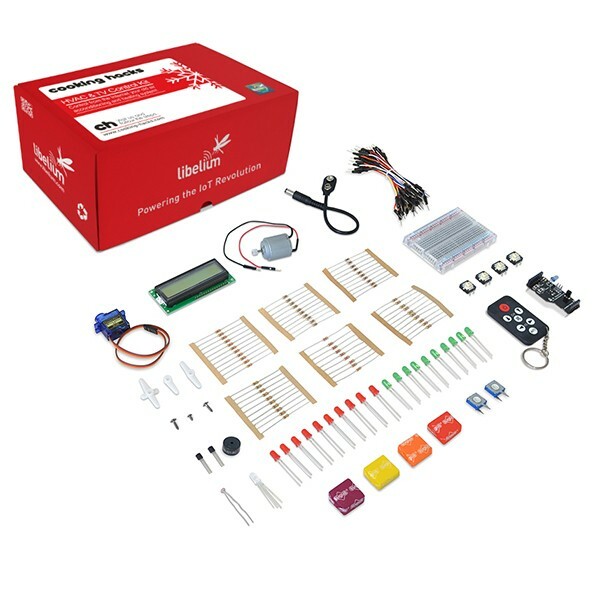 Further discount on the IoT Spartans Challenge Waspmote kits for students. 400 code examples and more around 60 technical guides to easily create a syllabus with free access. Free access to our Forum Service -exclusive for customers- to support teachers who require solving student’s questions. The IoT Spartans Challenge starts on June 15 with the Summer School, a period to warm up with some free webinars that explain basic concepts of the Internet of Things using our IoT platform Waspmote. The enrollment for IoT Spartans Summer School finishes on June 1, so hurry up and register your university in the contest, it is the best chance to put your educational entity on the Internet of Things world map. This entry was posted in Contests and Promos on May 22, 2017 by Cooking Hacks. 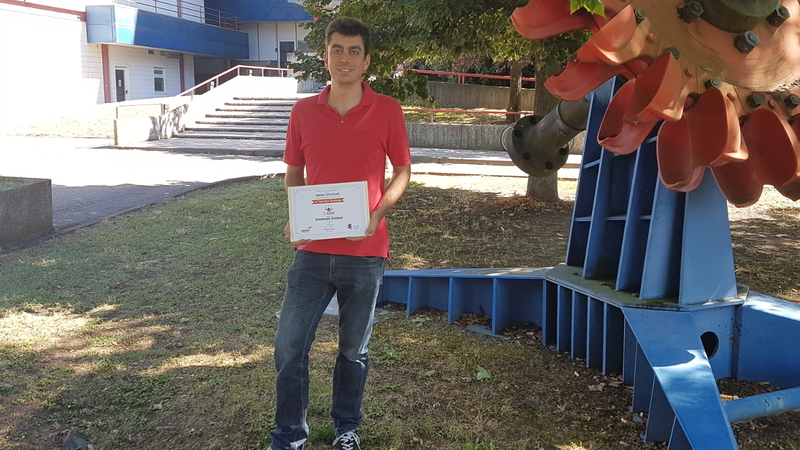 During the last week of April Emanuele Goldoni, the winner of the first edition of the IoT Spartans Challenge, visited the University of Bergamo, Italy, and held a seminar on Radio Technologies for IoT. The presentation was framed in a course about multimedia Internet networks. 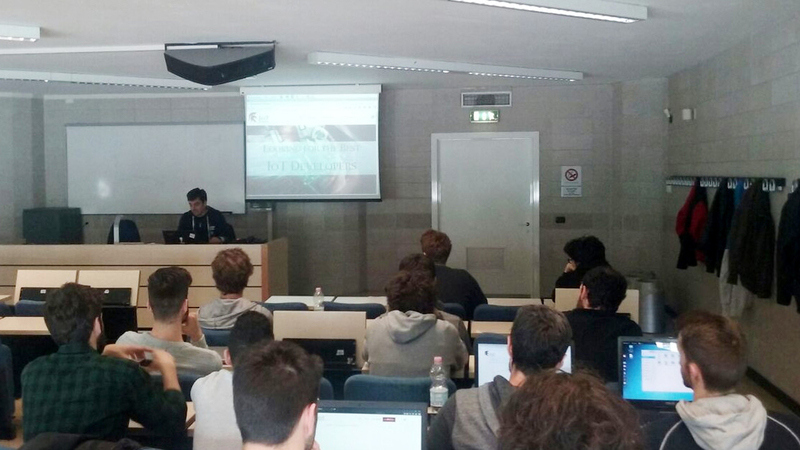 During the seminar, Emanuele described his experience with the past IoT Spartans Challenge and promoted the new edition of the contest among the students. Then, he provided an overview of the standards for low-rate WPAN and the emerging protocols for LPWAN. Finally, using a couple of Waspmote Sensor Platforms, he showed how to program the devices and compared the rates and ranges achievable by 802.15.4 and LoRa radio modules through a live demo. Follow in Emanuel´s steps and get involve in the IoT. He discovered the potential of Libelium Waspmote Sensor Platform at the same time he was climbing the ranks of the IoT Spartans Challenge 2016 edition. What are you waiting for? This entry was posted in General, News and Events, Waspmote on May 16, 2017 by Cooking Hacks. E-health is meaning a disruption on health care field. The fact of joining IoT and medical attention is changing the way that people deal with their health. There are several researchers driving projects and developing devices to collect, store, process and communicate health data with the goal of bringing people closer to health data, self-exams, databases and some self-diagnostics. Today, we show a project which improves how is processed and showed the information collected with our e-Health sensor platform MySignals. 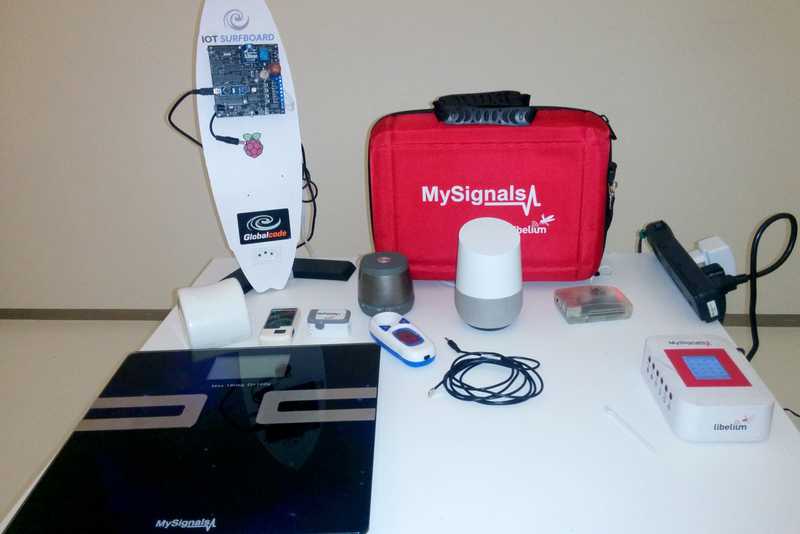 The hardware base is MySignals SW BLE Complete Kit, basically using its BLE sensors, a Raspberry Pi 3 and Google Home, the hands-free Google Assistant voice-activated speaker. The project has two parts. The first part of the deployment consists in an integration of MySignals Cloud with a local database. For that, the developers have made this integration using Node-RED and REST interfaces to read the data and then push them to a personal MongoDB database. The second part of the project is an innovative voice control of MySignals BLE sensors. They are paired with a Raspberry Pi via bluetooth and triggered with the Google Voice assistant of a Google Home device. After collecting the data, they are sent to MySignals Cloud. They are read using Node-RED and then visualized in a dashboard at the same time that the speaker says the values loudly. 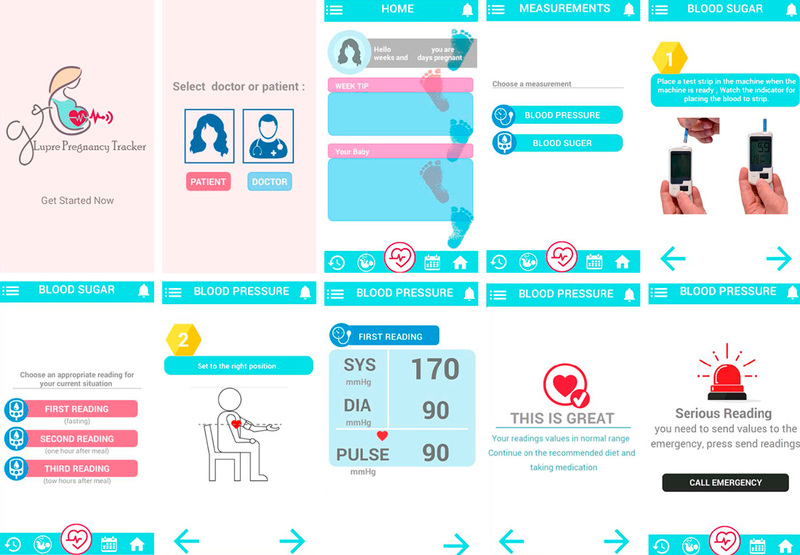 Vinicius Senger, the CTO and Inventor from Globalcode, is carrying out this e-Health project, showing demos in important events and hackatons around the world like the IoT Tech Day, Amazon Smart City hackathon at The Developers Conference or j-spring. Follow in Vinicius' footsteps and discover the countless applications and possibilities that brings MySignals e-health sensor platform. This entry was posted in General on May 8, 2017 by Cooking Hacks. Smart Agriculture is getting increasingly present in our daily life. This kind of deployments are settled in the countryside for a while, but nowadays Smart Agriculture projects are having a huge growth in cities. Modern cities are getting involved in the Internet of Things and are improving their management with smart projects. 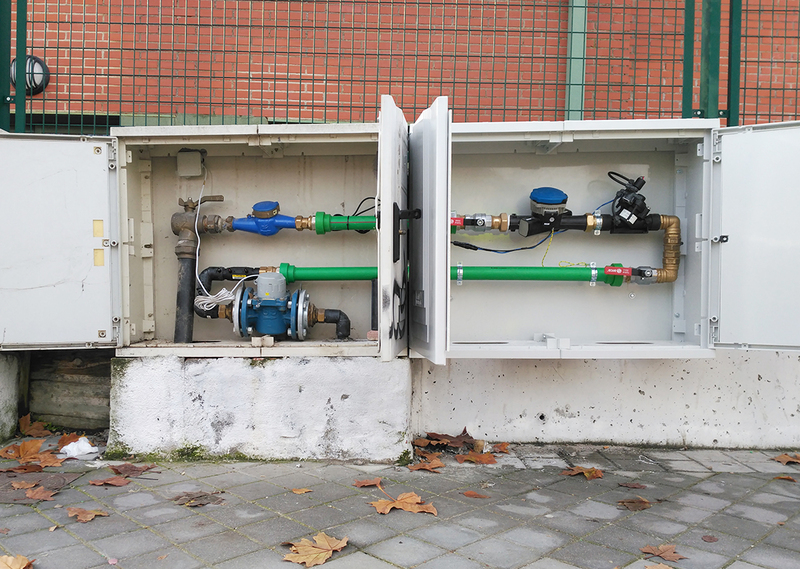 In this case, Barcelona deployed a smart irrigation system based in Waspmote Sensor Platform in Poblenou Park Centre. The deployment is based on sensors technology and consists in allowing remote control of the irrigation system to facilitate the management of the water network. This new irrigation management system allows an automatic control of the electronic valves that close or open the water flow. 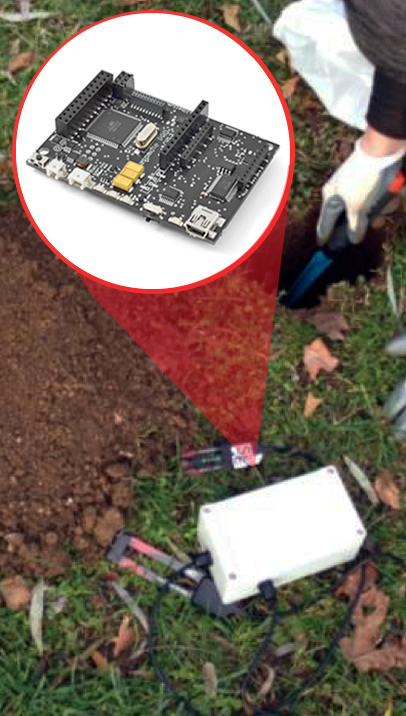 The project is compound by soil moisture probes located underground together with Waspmote Sensor Platform. They are put inside waterproof boxes that ensure highly durability. Besides, these devices are powered by a long-life battery with one year autonomy. Data gathered by Waspmote Sensor Platform can be sent to a gateway or directly to the cloud. It can be done through several communication protocols, such us GPRS, 3G, 4G, LoRaWAN, LoRa, Sigfox, 868 MHz, 900MHz, ZigBee, 802.15.4, WiFi, RFID, NFC and Bluetooth 4.0. In this project, data is sent through ZigBee to a Meshlium Gateway, provided by Libelium, and from there to the cloud using 3G. The information collected can be visualized in a platform which concentrates and allows knowing the state in each zone and it can be controlled with computers, tablets and also smartphones. The system optimizes water consumption because it irrigates with the proper amount according to weather conditions and the plants’ needs. Thanks to this new management system the municipal water bill has been cut down near a 25% in the city. Moreover, this reduction is not just about money, the water usage has been reduced too. Barcelona is saving resources such us water with Waspmote Sensor Platform and contributing to enhance the environment too. For gardeners, their daily work tasks has been eased too. Controlling the irrigation system and detecting any incidents that may have occurred can nowadays be checked in real-time. 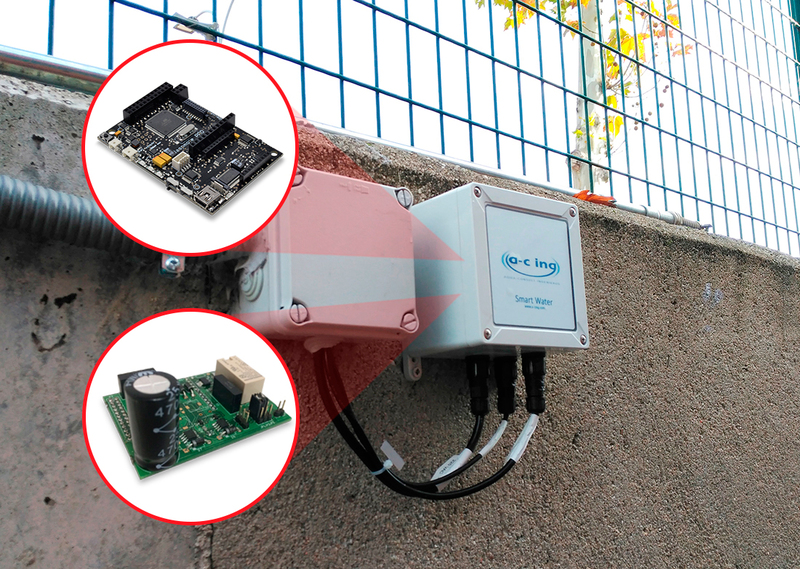 This project led by Barcelona City Council joins hardware components which gather data and send them through a gateway to the cloud in order to be visualized for irrigation management. This gives an idea of the versatility of Waspmote Sensor Platform, which can be used in the most professional projects. If you are interested in developing a Smart Agriculture projects, in Cooking Hacks you can find one of the most versatile and professional IoT kits, the Waspmote Agriculture Sensors Kit. 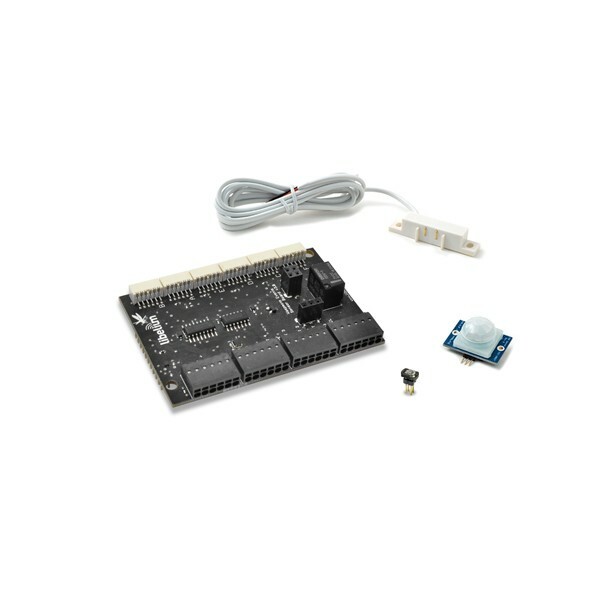 This kit allows to monitor multiple environmental parameters involving a wide range of applications, from growing development analysis to weather observation. 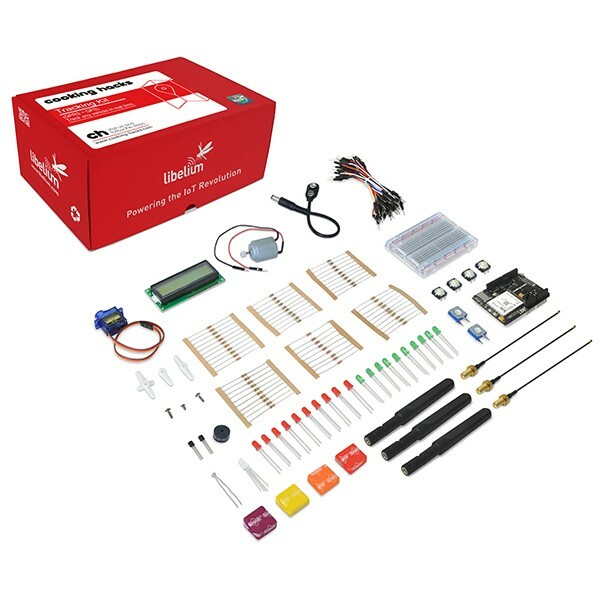 This kit contents specifically Waspmote Agriculture Sensor Board, which allows to connects these sensors: Digital Temperature & Humidity Sensor, Soil Moisture Sensor and Atmospheric Pressure Sensor. Anyway, the Agriculture Sensor Board enables to connect up to 14 sensors at the same time, for example sensors for air and soil temperature and humidity, solar visible radiation, wind speed and direction, rainfall, leaf wetness and fruit or trunk diameter (dendrometer). With the objective of extending the durability of the device after the deployment, the board is endowed with a solid state switches system that facilitates a precise regulation of its power, prolonging the life if the battery. Discover how the Waspmote Agriculture Sensors Kit can be your best fellow traveler when you start deploying Smart Agriculture projects, whether in the countryside or in the city, helping you to make the difference. This entry was posted in General, Waspmote on April 25, 2017 by Cooking Hacks.